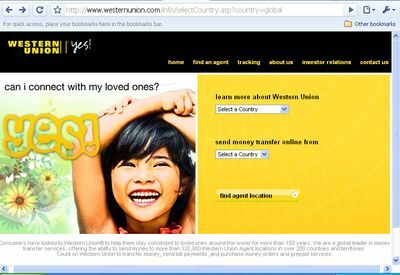 OFWs or Overseas Filipinos can make fast money transfer at Western Union website or agent. You can send money fast and transfer money instantly. Western union history of 150 years makes it a trusted brand for money transfer services. I’ve been receiving money from abroad through Western Union international money transfer. It is always fast, easy and secure. Its more than 6,300 money transfer locations in the Philippines make pick up easier. There is a money transfer agent almost everywhere. You can send money to the Philippines using Western Union prepaid card or send money via credit card. In both cases you can send money via the internet. 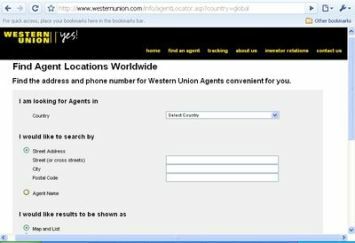 Or go to an agent near you using the Western Union locator. You need a Visa or MasterCard credit card to do that. The site requires you to register to transfer money from credit card. No credit card? Get the Western Union prepaid card, a debit card that works in the web site as well. This is good if you send money to the Philippines on a regular basis. Choose find agent location at the Western Union website to find a Western Union money transfer agent. Western Union has more than 379,000 agents in 200 countries and territories. I’m sure there is an agent nearest you. Make a fast money transfer with an agent in easy steps. These steps depend on where you are sending from. Bring a valid photo ID and your Western Union Gold Card if you have one. But be careful of Western Union scams. You cannot reverse the process once you sent the money. Check the Money Transfer Control Number or MTCN on the receipt. Give your recipient the MTCN and the amount sent. Western Union will not release the money without the MTCN. Tracking your online money transfer lets you know the status of your money. You will know when the money is ready or picked up. This shows how Western Union makes a fast money transfer to the Philippines. Go to the Tracking link on the home page of the Western Union website or sign in to your account. Track the status of your money by typing in your name and the MTCN. Your name must be the same as signed in the send form. Western Union is not the cheapest way to send money. Western union rates and fees are one of the highest in the money transfer business. But you can count on it for an easy, secure and fast money transfer to the Philippines.